Aim: Cardiopulmonary resuscitation (CPR) has been frequently performed on critically ill or trauma patients. The aim of this study has been to determine success rate of CPRs in our surgical intensive care unit and to define and compare characteristics of patients for whom CPRs have not been effective. 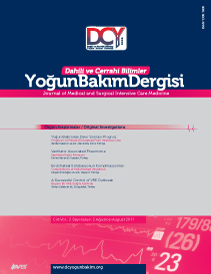 Material and Methods: We identified all critically ill patients between 1 May 2002- 30 June 2003 on whom CPR was performed in Hacettepe University General Surgery Intensive Care Unit. Pre-arrest morbidity (PAM) index, Acute Physiology And Chronic Health Evaluation (APACHE) II score, demographics, clinical features, primary and co-existing diseases were analyzed. Results: Eighty-eight CPRs were performed on 48 patients. Rate of first successful CPRs were 39.5 % (n=19). Presence of ventricular tachycardia (VT) or ventricular fibrillation (VF) as initial rhythm and absence of cancer were significantly related to the success of CPRs (p=0.004 and 0.05, respectively). After 12 months follow-up, overall mortality after CPRs was 97.8 % and mean PAM was 8.8 ± 2.1 with a life expectancy 1.2% which was concordant with expected mortality after CPRs. Conclusion: CPR is not an effective treatment in patients with malignancy or high PAM index in surgical intensive care unit. Patients with VT or VF have favorable outcome. Legislative regulations, due to medical ethics, are needed in order to stand out for CPRs on patients with possible good results.